Place the oven rack in the middle position and preheat the oven to 325 degrees F. Place a roasting pan filled with several inches of water on the bottom rack of the oven (see Chef’s Note). Remove the bottom of a 9-inch springform pan and cover it tightly with aluminum foil; then reassemble the pan and spray the bottom and sides with cooking spray. Combine the cookie crumbs with 1 Tablespoon of sugar and the melted butter or margarine. Using clean hands, press the mixture onto the bottom of the prepared pan. Stir 3 teaspoons of espresso powder into 2 teaspoons of water and set aside. Using a stand mixer or hand-held mixer, beat the cream cheese and 1 1/3 cups of sugar on medium speed until light and fluffy, about 3 minutes. Add the eggs, one at a time, beating after each addition. Add 1 cup of sour cream and the flour–mix until well combined. Stir in the espresso/water mixture and the melted chocolate. Spoon the mixture over the crust. Bake at 325 degrees F for 1 hour and 10 minutes, or until the center is set but jiggles slightly. Turn off the oven and let the cake stand in the oven for 25 minutes with the door closed. Meanwhile, combine the remaining 1 1/2 cups sour cream with the remaining 3 Tablespoons sugar and the remaining 1 teaspoon espresso powder. Once the 25 minutes are up, spread the mixture over the cheesecake and return the cake to the oven to let stand with the door closed for 5 more minutes. Remove from the oven. Run a sharp knife around the edges of the cake and cool on a wire rack. Refrigerate the cake 8 hours or overnight. 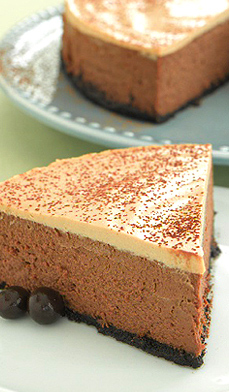 Remove the cake from the pan and garnish with a sprinkling of cocoa powder or chocolate-covered espresso beans.